Fourth Row Center: Film Writings by Jason Bailey: In Theaters: "The Adventures of Tintin"
In Theaters: "The Adventures of Tintin"
In spite of the fact that the comic book series is, according to reliable Internet sources (read: Wikipedia) “one of the most popular European comics of the 20th century,” this writer came to the film entirely ignorant of the character at its center. Thankfully, it’s an inclusionary film; about all you need to know is that the titular character is an intrepid boy reporter (earnest, square-jawed, and a little dull—just as he should be) who is assisted on his adventures by his faithful sidekick, an adorable pooch named Snowy. Spielberg’s film is based on three of Hergé’s comic books, adapted for the screen by three terrific British writers: Steven Moffat (Doctor Who, Coupling), Edgar Wright (Hot Fuzz, Shaun of the Dead), and Joe Cornish (Attack the Block). The trio have concocted an energetic screenplay, filled with comic ingenuity, brought to life by Spielberg with the globe-trotting high spirits of an Indiana Jones flick. The story itself is a deliciously convoluted affair; the less said about it the better, not only because it’s fairly difficult to encapsulate, but because it ultimately doesn’t matter much. It’s the clothesline on which to hang the comic bits (the picture displays a wicked sense of slapstick—no small feat, coming from the director of 1941) and breathless set pieces. It would seem a fair guess that Spielberg’s primary interest in making an animated film is the form’s freedom to carry off the impossible—in scene after scene, we see him having a ball creating the kind of oddball compositions, endless tracking shots, and mind-bending transitions that he simply can’t do when working in live action. His chases are elegantly staged, particularly a breathless, unbroken ride-along on a motorcycle pursuit that spills off of the land and onto the sea. A scene of a pirate attack is more fun than all of those Pirates of the Caribbean films combined, culminating in a shot that follows both a dizzyingly looooong trail of gunpowder and the swordfight that runs parallel to it. And there’s a wonderful moment early on that chases Snowy as he bounds up a flight of stairs, through their apartment, and to the window facing their street in a single, stupendous motion. In moments like that, you can feel the filmmaker taking full advantage of the opportunity to free himself of practicalities and do whatever the hell crazy thing he wants. A word about Snowy: this little fox terrier is a triumph of character creation and animation, a presence delightful almost to a point of distraction—on more than one occasion, this viewer ceased paying attention to foreground action because they had Snowy doing something so adorable in the corner of the frame. The rest of the characters are given dimension and personality by a talented cast that includes Jamie Bell, Andy Serkis, Daniel Craig, Toby Jones, Cary Elwes, and (as spectacularly dull-witted police detectives Thompson and Thomson) Wright’s old buddies Simon Pegg and Nick Frost. But for all of their efforts in the voice department, that performance capture method is an obstruction to the full success of The Adventures of Tintin. Spielberg and his team should have either made a live-action movie or an animated one; what they’ve got is a hybrid style that is inferior to either choice. Ultimately, the crispness of the storytelling, the ingenuity of the direction, and the excellence of the voice work allows the viewer to overlook the unfortunate technique. But there’s no question that it is a hurtle. 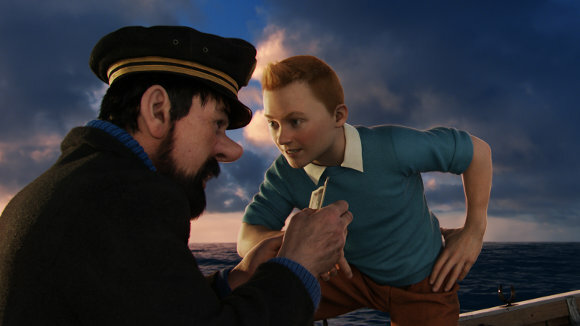 "The Adventures of Tintin" opens Wednesday in wide release.